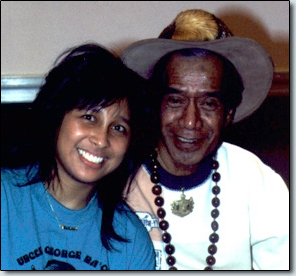 George Na'ope was co-founder of the Merrie Monarch Hula Festival and served as one of the first judges of the competition. He has judged hula competitions worldwide. He has travelled the world over performing and teaching hula. “Uncle” George believes that hula is for everyone; not just Hawaiians. George Na'ope was born in Hilo, and at age three his grandmother Malia Na'ope started him in hula. At four he began to study with Mary Kanaele who was mother and teacher to Edith Kanaka'ole. When he moved to O'ahu, he studied for ten years with Joseph Ilala'ole. He also studied with Antone Kao'o, Iolani Luahine, Lokalia Montgomery, Annie Hall and Jennie Wilson. He 'uniki'd from Tom Hiona. He began to teach at age thirteen, because his family was poor, charging fifty cents per week so he could get through school. He taught chant and kahiko to the Ray Kinney dancers, and travelled with Ray Kinney. Copyright © 1995-2009 Karen R Sabog. All rights reserved.